The idea is that signature resolution is like the spread of your shots - all shots will fall within that radius, with a higher signature resolution meaning a wider spread, and a smaller signature resolution meaning a narrower one. When the spread is larger than the target (i.e. 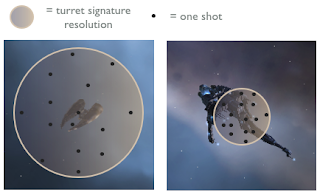 signature resolution is larger than the target's signature radius), some shots will miss. It's a simple explanation, and it's an easy one to understand. However, it's not actually correct. The shotgun explanation would suggest than even when stationary or moving slowly, a large proportion of your shots would still miss a small target, simply because it is small. We know that isn't the case though - if a small target is moving slowly enough, we can still hit it almost 100% of the time. The true explanation then is slightly more complex. Ready? Let's go. Signature resolution is a modifier of your tracking speed, nothing more. Your tracking speed is not constant - your guns can track faster when shooting at larger targets, and will track slower when shooting at smaller targets. When you think about it, this makes a lot of sense - if you imagine trying to keep a gun pointed towards a fast moving object, it's much easier to do that if the object is big than if it's small. What your signature resolution represents is the kind of target for which the gun will track at the speed it says on the box. When you say a turret has a tracking speed of 0.5 rad/s and a signature resolution of 150m, you're actually saying 'this turret can track a 150m target at 0.5 rad/s'* (say it like a space captain and it actually sounds kinda cool). The same turret would also track a 300m target at 1rad/s and a 75m target at 0.25rad/s, but rather than give you a meaningless figure the turret attributes just give you the one for the ships it thinks you'll be fighting most (that is, cruiser guns tell you how well they would track another cruiser, while battleship guns tell you how well they would track another battleship). Think of it like this: The tracking speed listed on your gun is how fast the turrets can track when they're operating as designed, and the signature resolution tells you what kind of targets they are designed for. If those turrets are firing at something smaller than they are designed for, they aren't able to keep track as easily. When their target is larger than design, it's so easy to keep track of it that they can do so even if it's moving faster than they can normally track. *For simplicity, I'm taking 'can track' here as meaning you're able to deal meaningful damage to your target. When a target's angular velocity is equal to your tracking speed your damage output will still be significantly lower than it would be under ideal conditions, but you should be hitting around 50% of the time. Quick question, but the "Shotgun explanation" effectively explains why you shouldn't turn your MWD on in a small ship when you see a bomb get launched, doesn't it? Or is that a different ball game? Bombs are a different game. IIRC the damage you take is entirely related to how big your signature radius is. So then it would be safe to say it like this? Like, if the bomb's signature were, say 400m, and your ship's radius was 38m, where the bomb deals 6,400 Thermic Damage, your ship would take about 608 damage before resists are factored? Like, the 6,400 damage is spread equally across the 400m, so if your ship only takes up 9.5% of the space, it will take 9.5% of the damage? Regarding bombs - That's correct. It's probably not how I'd describe it, but the calculation is correct. I've been playing for years, right enough, but I just wish that your explanations didn't make it so obvious; about how bad ccp are (currently) at describing their own game. Lots of ppl don't understand how tracking works and how the dmg stat is actually somewhat *derived* from the tracking speed calculations. First, you only get a 100% hit rate if the target has zero angular velocity - stopped dead or moving closer or farther away, only. Any side to side motion reduces your hit rate to less than 100%. Second, saying 'this turret *can track* a 150m target at 0.5 rad/s'" (emphasis mine) implies it will hit it well, which isn't really true because it will only be **50% effective**. That is, the Eve math is such that a turret tracking a target with that is within optimal range and has a signature radius and angular velocity that matches the turret's tracking speed and signature resolution will only has a 50% chance to hit that target. So, perhaps think of it like this: The tracking speed listed on your gun is how fast the turrets are designed to track to be 50% effective, and the signature resolution tells you what kind of targets they are designed to be 50% effective on. Larger or slower targets improve your effectiveness, smaller or faster targets reduce it. Luccul - you're correct, 100% was supposed to read 'almost 100%'. Regarding the rest, I think we simply disagree on what it means to be able to track something. For me the difference between 'can track' and 'cannot track' is whether or not you're able to apply meaningful damage to your target, not whether you can apply full or nearly full damage. 50% damage is around the cut-off for that imo. The aim of the post is to make the topic understandable, so I'd rather keep the explanation simple where possible. To avoid confusion, I'll add a note. Yes, I do question the mechanic somewhat. It seems to me that with such high technology in New Eden that a gun that can track as fast as it's target flies ought to be able to do better than 50% efficiency. So that influenced my comment somewhat. I had a WTF moment when I first read the your post. But, on reflection, you are correct. The Eve mechanic allows your guns to have better tracking against larger targets. I struggle with the concept though. Thinking *realistically*, a target that can orbit you at twice your gun's tracking speed will out fly your gun regardless of it's size. Your gun will be pointing the opposite direction when the target has completed one orbit, and how can you hit that at all even if it's twice as big? It could have been made as an attempt to substitute for a gunners skill. For example, even if something flies faster than you can track it, a smart gunner could predict the object's flight path and wait for it to come around again. Luccul - not only that, but technically when you orbit a target your guns should not have to turn at all - relative to your ship, the target would always be in the same direction. Another way in which Eve doesn't really make sense! Have you ever tested that? When I was a 2-month old noob a corpmate took me out for a demo. He had me orbit him at some distance and fire one gun at him. Then he orbited me at the same distance, and again I fired one gun at him. Checking the logs later, I had a much better hit percentage when I orbited him. After learning the math, which says this shouldn't be so, I've never reconciled this experience. I was in a frig and he was in something bigger (I think - almost 3 years ago now), so I don't think he was faster than me, but maybe. I don't recall if he attempted to match my speed or not. Some day I'll try that exercise again. I wonder does it mean that the sig radius relation between guns and target gets used twice in the total damage calculation, once on the base damage and a second time on the tracking. I think the rp logic still holds up though if it needed to. If you regard an orbiting target like a planet around the sun moving at a certain angular velocity. The size of the target matters because unlike the planet a target can change its orbiting direction without changing its angular velocity. If one could see it from the point of view of the turret the difference is between following something along a line like the planet or trying follow your target across a screen where it changes direction. With bigger targets you have a larger margin for error when a target decides to change direction. BTW I could be totally wrong though I am no rocket scientist. I would also really like it if your own ships angular momentum, I think that is what it is called, could be added to the tracking calculation. So that you by turning your ship without moving you could make tracking for your guns easier. I think it would add a whole lot to the depth in space piloting. The damage calculation for turrets is chance based - it's basically a random number generator which gives you a result between 50% and 150% (except for wrecking shots, which deal 300% damage and occur 1% of the time) - that percentage is multiplied by the base ammo damage and the gun's damage multiplier (both fixed) to give you your damage output. Sig resolution and tracking don't actually affect damage directly - they simply determine how many shots miss (and as I mentioned, when shots begin to miss it's the 150% shots that disappear first, so it drops off quite quickly). There is some sense behind CCP splitting the final tracking value into two parts. Yes, despite what some people think, it functions a single value (sig res / tracking) that is multiplied by the situational / target number (ang vel / sig rad) for the final result, smaller is better for the shooter. Splitting it like this makes it easy to compare the two parts: sig res pairs with sig radius (is the target bigger/smaller than what the guns are designed to shoot at? ), while tracking pairs with AV. In addition, sig res is fixed (I'm not aware of ANY in-game mechanic to change sig res, except changing your gun size, while tracking can vary through item, skill, fitting, and EW. So, for a comparable size target, you can mostly just compare tracking to AV without needing to divide out sig res every time. But we need to remember that sig res and tracking are ultimately just two factors that combine to a single game mechanic - tracking. Should be easy to test if you use a single gun. Put thirty shots or iterations for each variable into a spreadsheet and you should have enough data to produce a nice curve with normal distribution. Eliminate outliers with a box plot and compare the means. "Your tracking speed is not constant - your guns can track faster when shooting at larger targets, and will track slower when shooting at smaller targets. When you think about it, this makes a lot of sense - if you imagine trying to keep a gun pointed towards a fast moving object, it's much easier to do that if the object is big than if it's small." As EVE game mechanic goes this is true. But this does not make any sense in reality. What you can track and what you can hit is defined by computer and sensors. Tracking speed of turret means only one thing. How fast can turret turn. So if orbiting object makes 0.2 rad/s and your turret makes only 0.15 rad/s it can not track that target. If orbiting object makes 0.1 rad/s then turret can track that target. How much damage it makes to the target has nothing to do with tracking speed of turret, bot with tracking speed of computer and sensors. If we go to analogy of pointing a hand gun on moving target... You can turn as fast as you can. And that is it. Landing a hit is defined by information you get and how fast can you adapt to that information (correct location of your hits). So if target orbit speed is the same or faster then your turret tracking speed you can not hit that target. Size of the target can only affect probability of hits. But that has nothing with tracking speed of turret. Lets say Phalanx CIWS system on a Cruiser (real one, on the planet earth) is tracking F-16 orbiting a ship at 5 km distance at speed of 1000 km/h. And we have Harpoon missile at the same orbit and same speed. Landing hits on F-16 would be a lot easier. Just because you have a lot more freedom at making error where to put a hit. Miss your target by 50 cm in elevation would mean you still put your round in F-16. But you would miss the missile. And so on. Tracking speed of turrets is just that. How fast can turret turn. Size of the target and probability of hit has nothing to do with tracking speed of turrets. This should be part of ships specs (how much does ship tracking affects damage on fast target, and resolution should be part of that, not just licking speed). So... no this does not make any sense . Unfortunately it's in good company - very few of Eve's mechanics actually make sense when compared to reality. While in most cases the Eve version is simpler (for example the 'underwater' physics model Eve uses instead of actual spaceflight mechanics), tracking is one of the situations where I think the Eve version is actually harder to understand.